ICFAI Tech School Admission Test (ITSAT) is a national level entrance test conducted by ICFAI Foundation for Higher Education, Hyderabad. The entrance test is conducted for students seeking admission into the engineering under graduate course B.Tech. 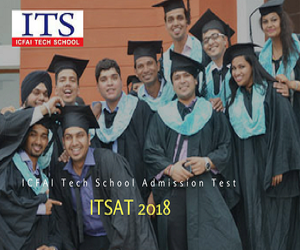 ITSAT 2018 entrance test is an aptitude test which will be conducted in both Online and Offline mode. 1) Candidates should visit the ITSAT official website http://www.icfaiuniversity.in/itsat/ to apply online or Candidates can also download the ITSAT Application or get from ICFAI offline centres. 2) Candidates should fill the application form with the relevant details like personal and academic details, communication address, valid email id and mobile number etc. 3) Candidates need upload their recent photograph with specified dimensions and size. 4) For offline application form candidates need to pay the application fee to get the application form. 5) Candidates also fill the application online & download the form. Then sent the application form along with Demand Draft of Rs 700 /- in the favour of “IFHE - Prospectus Fee A/c ITSAT 2018” payable at Hyderabad. 6) Candidates who apply through online mode can pay the application fee through payment gateway (Credit / Debit Card / Internet Banking). 7) Take the printout / Xerox of the application form for future reference. 8) Schedule the slot for the exam in the given dates by logging using application number and registered password. Candidates of all categories need to pay the application fee Rs.700/-. 1) Candidates should acquire 60% and above aggregate marks in Class 10 & Intermediate / Class 12 or its equivalent with Physics, Chemistry, Mathematics and English as subjects. 2) Candidates who are waiting for their Inter / Class 12 results can also apply for the entrance test. 3) Candidate should fulfil the minimum age requirements as prescribed by the respective Board through which the applicant has appeared for the qualifying examination. 2) Consist of 120 objective type questions. 3) The test for total 120 marks. 4) For every right answer 1 mark will be awarded. 6) The medium of the question paper will be English only. 7) The total duration of the test is 2 hours. 8) There is no negative marking. 2) Admit Card is mandatory to enter the test centre / hall. 3) Candidates can download their hall ticket using their login id and password. ITSAT 2018 entrance exam results were released on Lsat week of May 2018. Students can find the results at the ITSAT 2018 official website. Candidates must download the results and produce the rank card on demand. 1) Candidate must ensure that the photograph uploaded is clearly visible. 2) Carry the admit card to test centre or hall. If failed to produce the admit card on demand, the candidates will be not allowed to appear to the test. 3) Carry a valid identification card (Voter’s Card/PAN Card/Driving License/Aadhaar Card/Passport). 4) Candidates are advised to report to the test centre in advance to complete the formalities and security checks. 5) Candidates are not allowed inside the exam centre/hall after the commencement of the test. 6) Candidates who violate the rules are dealt as per the test centre regulations. 7) Any candidate who uses unfair means will be dealt according the rules & regulations of the test centre. There are no time tables!